Your Favorite Locations Are In This Game: If you’ve ever played an Elder Scrolls game before, you probably have a soft spot for some iconic swath of Tamriel’s geography. It sounds silly, but it’s true; whether you’re exploring the snowy mountain ranges of Skyrim or the ash-covered wastes of Morrowind, the Elder Scrolls games are defined by the memorable worlds they allow you to explore. The developers at Zenimax Online are keenly aware of this, and they made a point of showing off well-known landmarks from every Elder Scrolls game as they exist in The Elder Scrolls Online. During our demo we saw Morrowind’s Red Mountain, the Redguard capital of Hammerfell, ancient Dwemer fortresses and mysterious Altmeri ruins. The game looked gorgeous, and anyone with fond memories of exploring Tamriel in a previous Elder Scrolls game can expect to get kicked square in their sense of nostalgia by The Elder Scrolls Online’s vast virtual world. A Daedric Prince Steals Your Soul: No matter what kind of character you create, your personal story begins when the Daedric Prince Molag Bal steals your soul. This curses you with immortality until you get it back, which handily explains why players in The Elder Scrolls Online can constantly be cut down in combat only to rise again for another round. It’s sort of like the opening to Planescape: Torment, except this time the game might not end when you earn your mortality back. Necromancy is actually a common problem in The Elder Scrolls Online; not only are there potentially millions of players running around as soulless vagabonds, the kings of Cyrodiil have actually made a pact with Molag Bal to raise undead armies with which to conquer their enemies. Real-Time Combat In An MMO: Get ready to hold down keys in order to charge up your hammer swings or keep your shield up. Character in The Elder Scrolls Online have a Stamina meter (much like previous Elder Scrolls games) which can be depleted in order to fight defensively or charge up attacks for more damage, and using these abilities deftly in combat will net you Finesse points. While we don’t yet fully understand how these Finesse points will work, a Bethesda rep suggested that players who earn enough Finesse points will be rewarded with extra treasure. During our demo we witnessed a character receiving extra loot after a battle, and it seems like a smart way to reward skilled players with better items and gear. Characters Have a Voice: At least, the most important ones do. During our E3 demo we witnessed major NPCs speaking their dialogue aloud, though the player character remained silent. We don’t know yet whether all dialogue in the game will be spoken, but the most important figures in the game should have recognizable voice actors. This isn’t the first time we’ve seen an MMORPG with voice acting, but it’s a nice feature that makes the game feel more vibrant and alive. Previous Elder Scrolls games have featured well-known voice actors (Patrick Stewart, Sean Bean, etc) playing characters with pivotal roles, and hopefully The Elder Scrolls Online will be no exception. Open Player vs. 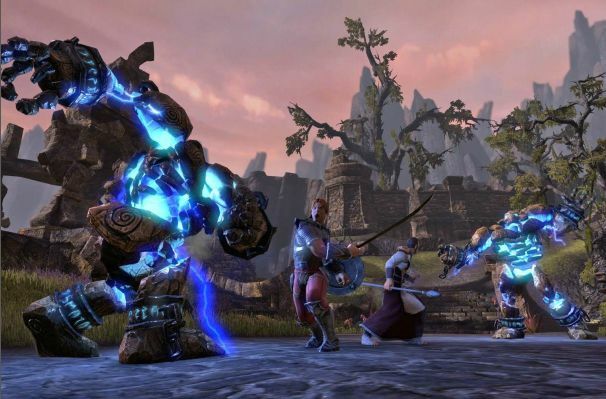 Player Combat With Persistent Consequences: When your Elder Scrolls Online character gains enough experience he should be able to take part in massive battles against other players to determine which player faction controls certain towns and territories. If you choose to take part in these battles you’ll engage in large-scale battles (with potentially hundreds of other players at a time) to conquer cities, siege castles and even crown a member of your faction as King of Cyrodiil. Of course, even if you win your faction will have to try and hold these titles, towns and fortresses against the other factions. If this sounds familiar, that’s because we saw a very similar faction vs. faction PVP system in Dark Age of Camelot, an older MMO that many of the current Zenimax Online employees previously worked on. Dark Age of Camelot was critically acclaimed for it’s tri-faction PVP battles, and it looks like The Elder Scrolls Online will be a worthy successor for PC and Mac gamers seeking a vast, persistent fantasy world that changes in response to it’s players.